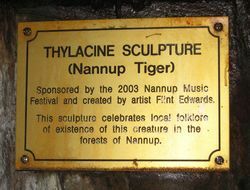 A sculpture of the "Nannup Tiger" celebrates the folklore of its existence. Reports of the Nannup Tiger seem to date back almost to the earliest European settlement of the southern corner of Western Australia. Sightings have continued to the present, being especially frequent in the late 1960s and early 1970s. It is thought that this increase was due to climatic conditions which forced the 'tiger' into the wooded areas around Nannup and district. 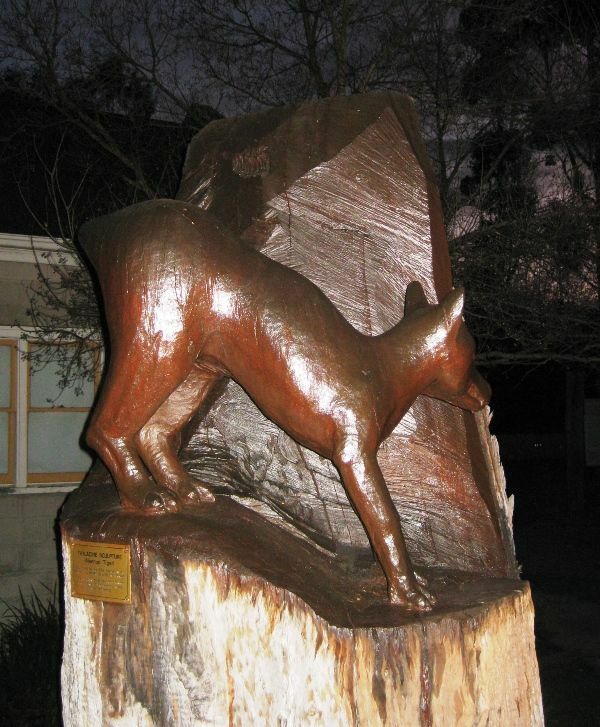 The Nannup Tiger - perhaps a survivor of an almost extinct species of carnivorous marsupial known as Thylacinus Cynocephalus (striped wolf with a dog's head) - has been seen as far north as Geraldton and as far south as Esperance. Various attempts have been made to capture the Tiger, though so far with no success. The animal remains part of Western Australian folklore, rather than Western Australian zoology. Festival and created by artist Flint Edwards.